I first saw this website a couple months ago and enjoyed the idea. 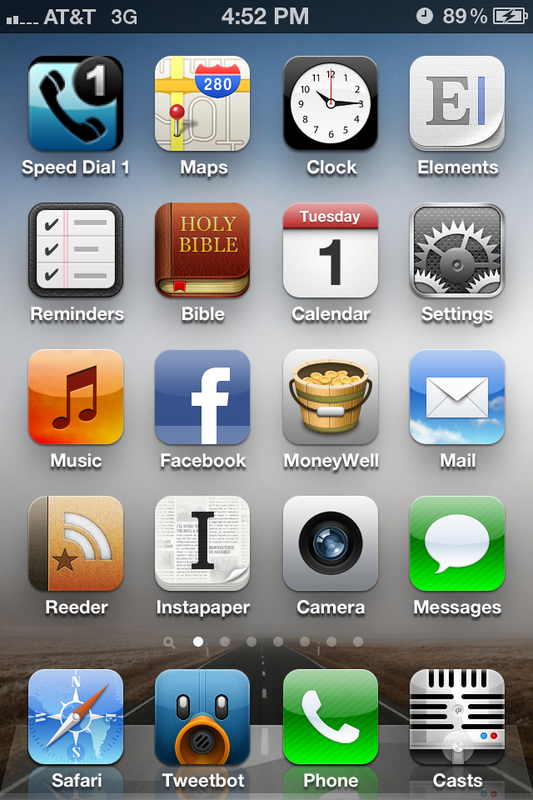 So here I present my homescreen of apps from my iPhone (and keep reading to find out why these are my top apps). First of all, I usually hold my phone in my right hand so on all my screens the most used apps are in the lower right corner where they’re most easily reached by my right thumb. 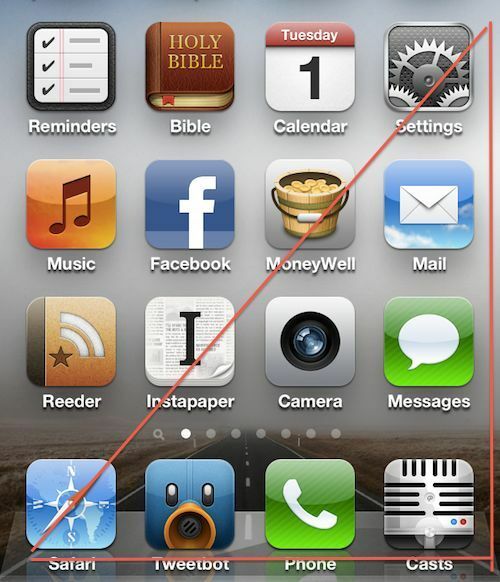 So here’s a quick run down of the apps starting in the upper left corner and going across left to right. Elements: great notes app that syncs with Dropbox. The great thing is that not only does it sync between iOS devices, but also puts a plain text version on your Mac. You can create or modify .txt documents into the Elements folder on your Mac and they show up on your phone. Reminders: again, it’s nice to be able to add reminders via Siri, but I find if I have location-based reminders it drains the battery too much if they’re generic, i.e. “remind me to get a new TV the next time I’m near Walmart”. If they’re shorter time-based location reminders it’s okay, like if it’s towards the end of the day and I set a reminder “take family out to eat when I get home”. You Version (Bible)*: awesome Bible app. I’ve got more versions than I need or actually could read and understand. Many versions are downloadable so that even when you’re not in good wifi or cell coverage you can still read the Word. Calendar: absolutely essential in keeping our appointments, family activities, birthdays, etc in order. Deb and I share the same calendar account so we always have the same info when trying to plan something. Settings: I keep it on the home page, because I go in there often enough to adjust brightness, turn on/off wifi, adjust notification settings, or change my passcode so the kids don’t play on it all the time, that I don’t want to have to go hunting for it on another screen. Music: I don’t listen to music all that often on my phone, although it is my primary music playing device. I listen more to podcasts and I use a different app for that (see below), but again I don’t want to go searching for it on other screens when I do want it. Facebook*: I’m a reluctant FB user, but realize it’s a great way to make connections with folks and it’s other people’s primary online network so I need to check in every once in a while. 99.5% of what I post on FB is done automagically via Twitter or this site. The other .5% is responding to messages I’m sent. Moneywell: keeps our budget in order. It’s based on the old “envelope” system (so Dave Ramsey would approve). You divide up your income into “buckets” and then spend out of them. No more money in the bucket? Stop spending. Mail: use it about 50x a day. Reeder: Google RSS reader. I get most of my tech news, as well as keep up with friends’ blogs. Instapaper: when I wanna read something later, it gets Instapaper’d. Camera: “the best camera…is the one you have with you.” This is the one I always have with me. Messages: #2 best way to get a hold of me. Safari: when I want to be a “know it all,” now I can be. This portable internet is like hair-extensions for my brain. Tweetbot: #3 best way to get a hold of me. Great Twitter app. Love the swipe-to-left or swipe-to-right feature to see replies/conversation view. Phone: #1 best way to get a hold of me. If it rings, you got a good chance I’ll answer if I can or for sure I’ll get back to you. PocketCasts*: best way to consume podcasts. I subscribe to 27 regularly updated podcasts. Some are updated daily, or weekly, or a couple times a month. So, not only is this the most beautifully designed podcast app, but it has great playback features and lets me know as soon as there’s a new episode ready to download. Do you have any apps that I should try out? Which ones hold the honored “firstand20” slots on your iPhone? 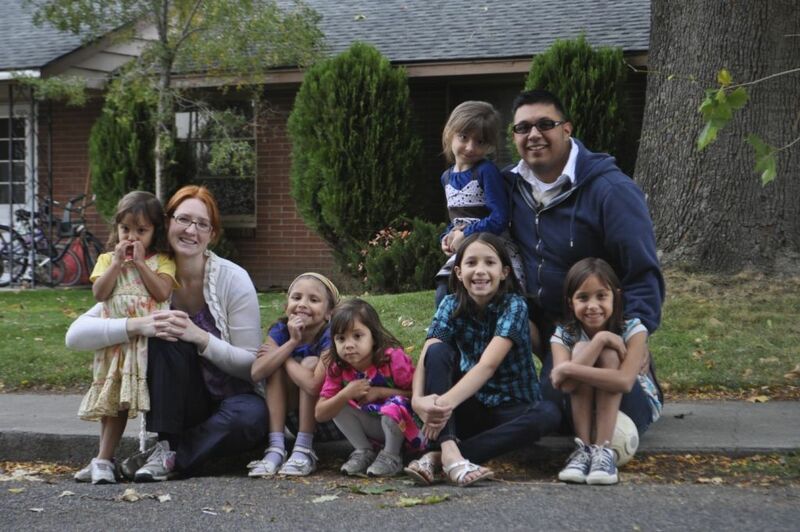 Guest Post by Abraham Lara: Abe is passionate about writing (blogging), community life, Apple/technology, and his family. He and his wife, Deborah, are raising support to join staff with FamilyLife. Read their full bio on their blog. Follow Abe on Twitter at abelara. Apps with an * are available for Android phones. For the unmarked apps, similar apps are probably also available for Android, such as for speed dialing.